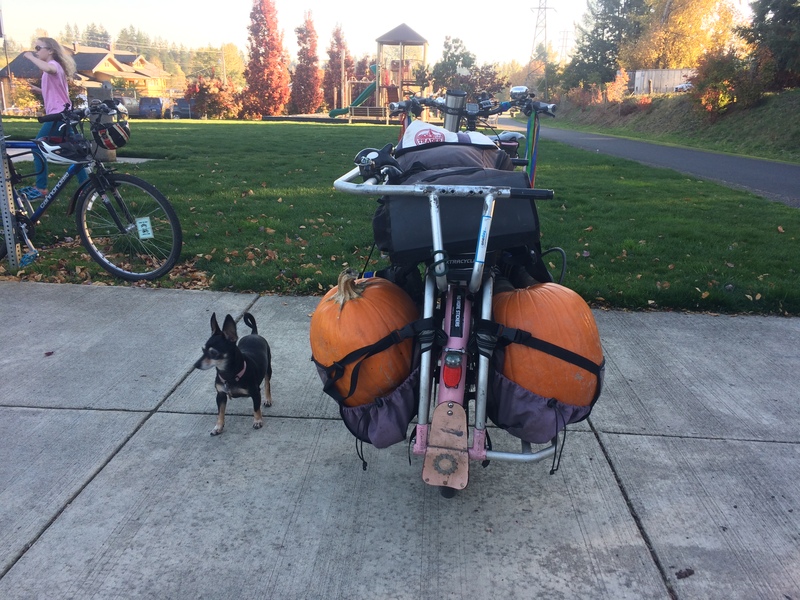 Ohmigosh we can bike to a pumpkin farm from our new home! 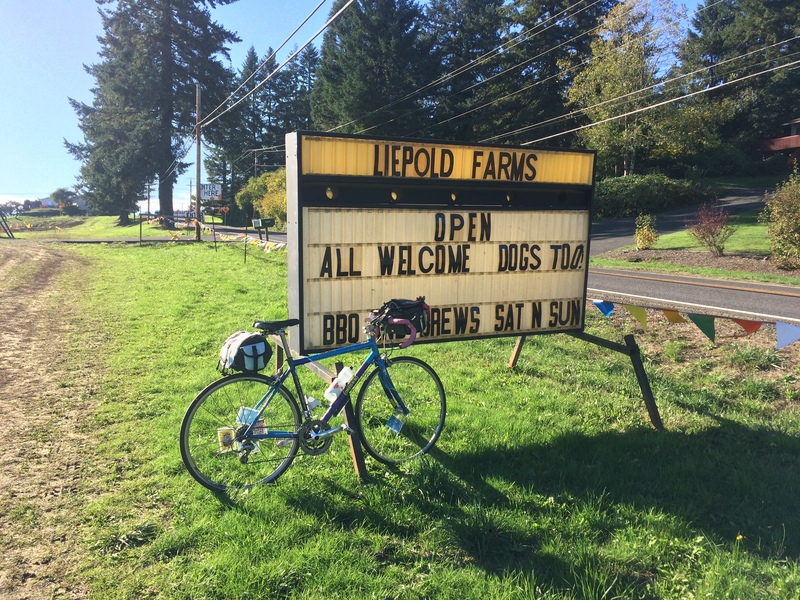 Liepold Farms in Boring, Oregon is just half a mile off the Springwater Corridor Trail and about 16 miles from our house in southeast Portland. 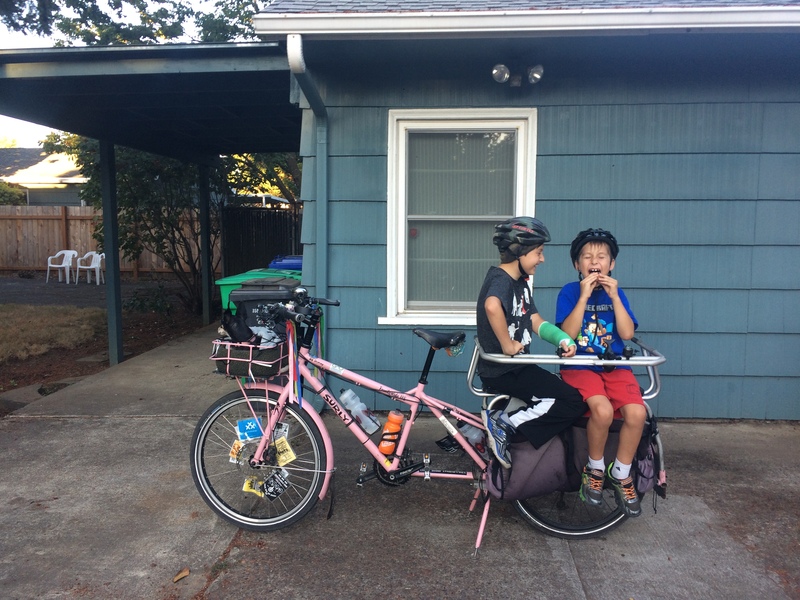 My kids had never biked 32 miles in one day before, but our previous big rides in Seattle were hilly and this trip is mostly flat so I figured they’d be OK with taking time for resting and snacking along the way. Here’s my route with some points of interest called out. The trip there took over three and a half hours (3:36 total, 2:05 moving time) including doughnut stop and the ride home was just about the same: 3:38 total including dinner stop and 1:55 moving time. I took a test ride alone during the week, mostly to see what the portion on Richey Road in Boring was like as well as to check out the trail-side encampment situation. 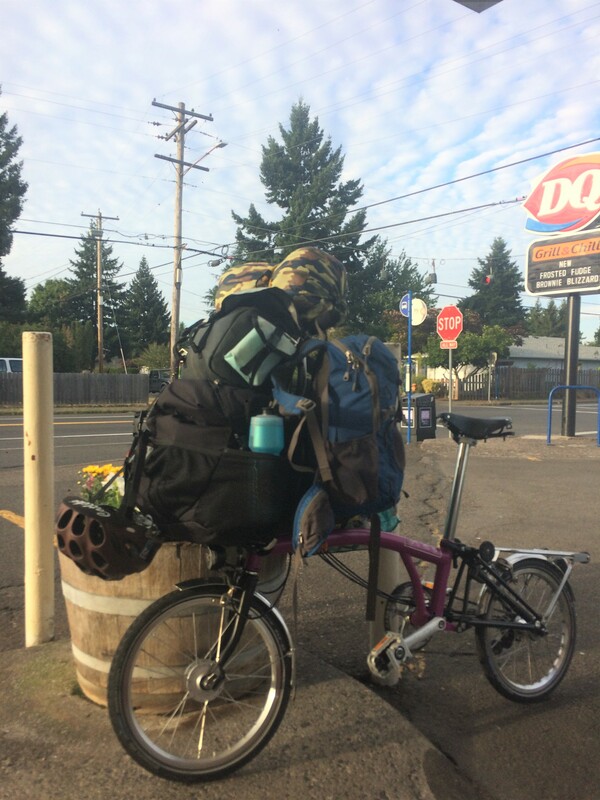 Multi-use trail shoulders make for safe camping spots (versus anywhere near cars, say), but sometimes encampments encroach on all or part of the trail and I wanted to know what to expect before bringing the kids through. On my Tuesday test ride there was a spot close to home where one guy had his stuff covering half the trail. This was close to where a group of people lived barely visible from the trail and he had cleared the stuff away by the time I went back by a couple hours later. Under I-205 a group living on either side of the trail had a branch stretched across the trail, I figured as a makeshift speed bump. That was gone on the way back, too. Come the weekend, the entire encampment had moved to a different spot. And once I got out of Portland there was just one lone tent visible from the trail. 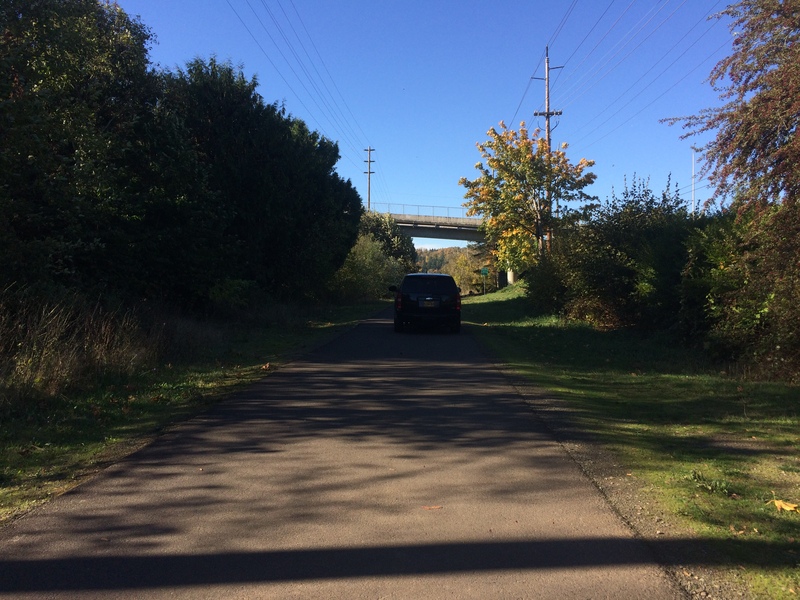 In Gresham I saw a serious looking vehicle talking to a homeless guy near some stuff strewn under a bridge. 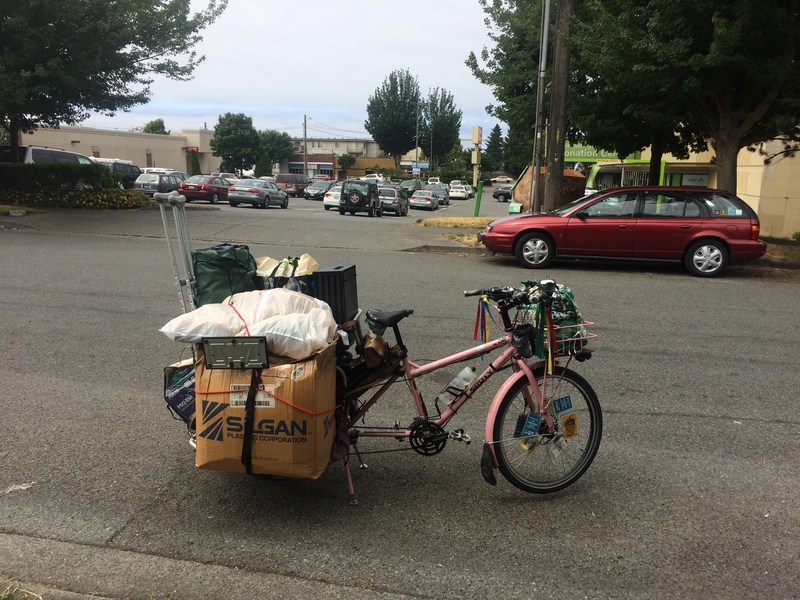 So while encampments tend to move around, I think there are rarely trail blockages, or even any tents, outside Portland proper. As for the half mile of country road, that sucked. Richey Road starts at 35 mph and goes up to 45 mph and there is a very small gravel-strewn shoulder. However, the farm looked so cool–even during my quick peek during the test ride–that I deemed it worth braving. I’m glad we went with friends because I wasn’t sure if I’d rather have the kids in front of me so my bigger, more visible bike was at the back (assuming they’d be game to ride ahead) or if I’d stick to my normal lead position. As it was we sandwiched the kids: parent, kid, kid, kid, parent carrying kid, parent. Best of both worlds! Plus the road had been swept by the weekend so we were OK in the shoulder, even the parts where it was pure gravel…though I rode to the left of the white line for some of the way. I think everyone behind me stayed on the shoulder. All cars passed us safely, but this is definitely not the type of road I like riding, with or without the kids. 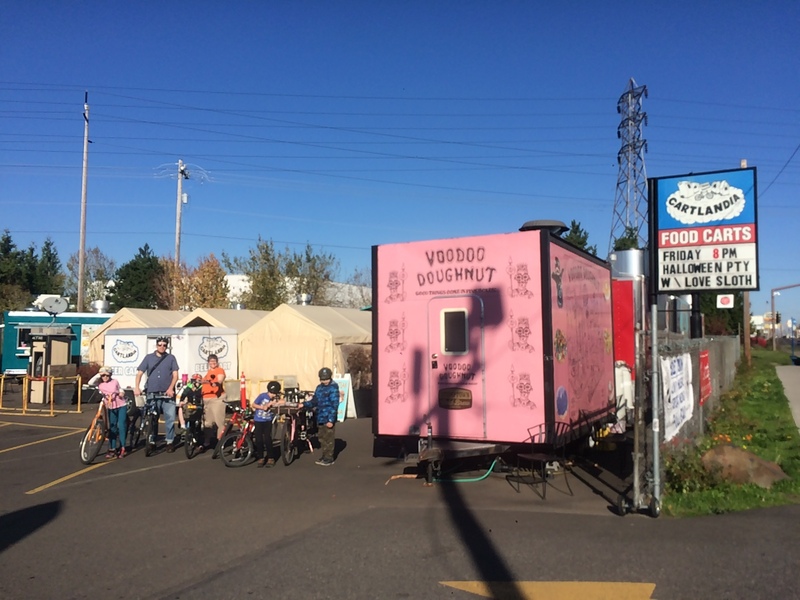 On the big day we met with Portlandize’s Kath and her family at Cartlandia, one of Portland’s many food truck pods, and the spot where we enter the Springwater Corridor Trail. The children were very excited about the Voodoo Doughnut truck so we waited a few minutes for it to open (at 10:30 a.m.) and eat doughnuts before setting out. My eight-year old got hungry again a mile and a half later (seriously?!) so we stopped at one of the many trail-side benches for him to eat a sandwich. Lots of these benches are at trail heads, this one at Beggars-Tick Wildlife Refuge. 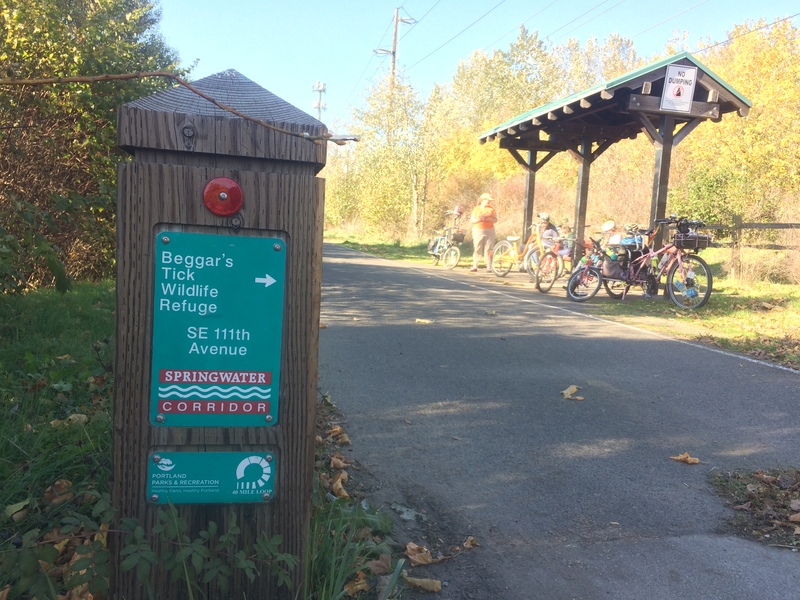 I need to ask around and see if it’s considered safe to leave bikes locked up alongside the Springwater Corridor Trail because there’s some great wetlands hiking to be done here. 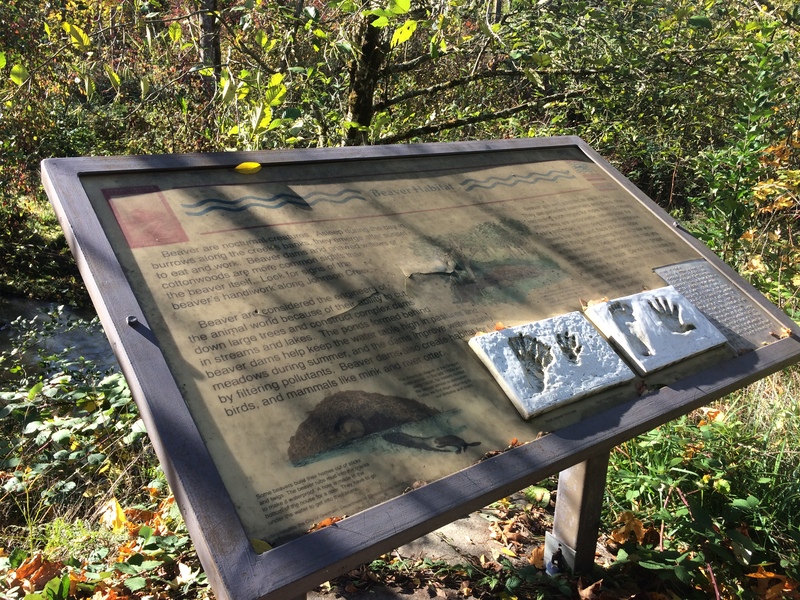 The trail also features an entrance to Powell Butte Nature Park. About halfway there we stopped at the Linneman Station Trailhead building, only to discover it temporarily closed, with even the water fountains shut off. The best stop is at the end of the trail: Boring Station Trailhead Park. It has everything! Water fountain, extremely clean bathrooms that “smell like a swimming pool,” and a play structure. We topped off our water bottles, used the facilities, and let the kids play on the play structure for a bit before tackling the crappy road. 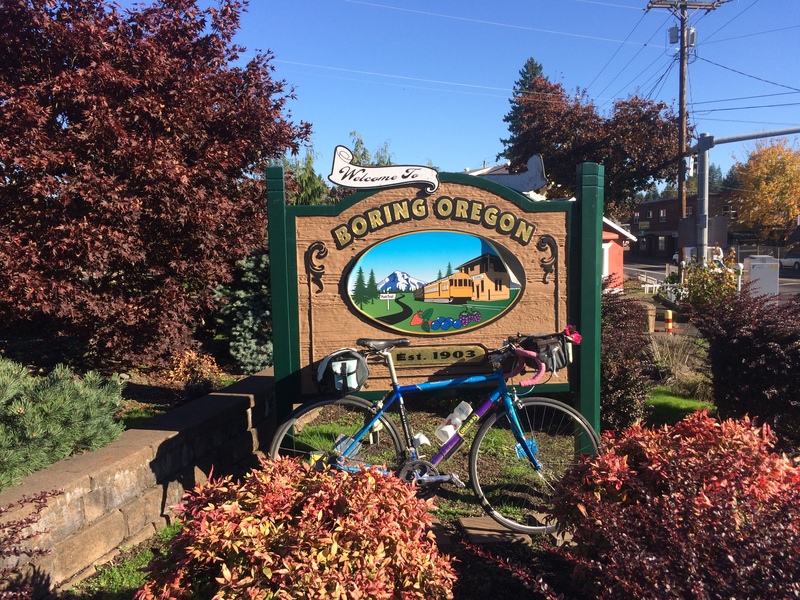 Note: the edge of the park, by the stop light is where you’ll find the “Welcome to Boring Oregon” sign if you want to take a photo with it. Snakes! I saw one little snake during my route test ride and my 10-year old saw one during our big ride. Caterpillars! Once it was warm out (for my test ride on the way back and for our weekend ride on the way out), we saw lots of fuzzy caterpillars. We make a habit of dodging them and during my test ride I saw evidence of other caterpillar lovers: a dog walker stooped to move one off the trail to safety and a mom and toddler crouched to watch one crawl past them. Horses! 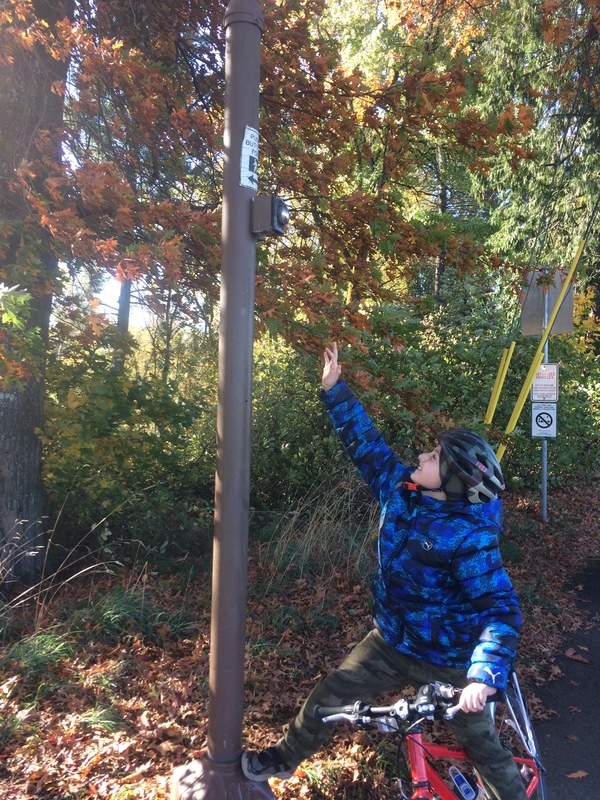 People ride horses on the Springwater Corridor Trail, and many intersections have crosswalk buttons set at walker/bicyclist height and at horse rider height. Sadly, the horses we followed across a street on Saturday were at one of the rare non-horse-height button intersections and one of the riders had to kick our short button with her foot. Sheep! 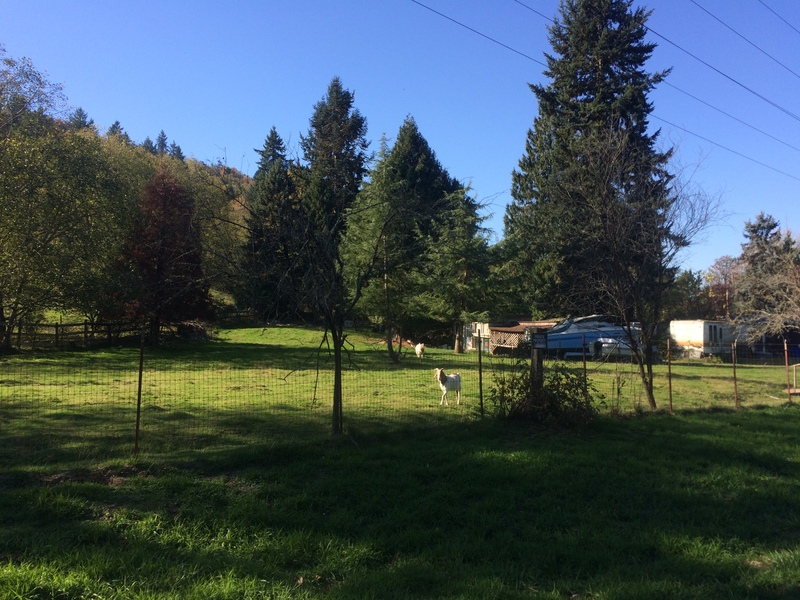 There are some sheep on the north side of the trail near Powell Butte (marked on my map). Fun joke opportunity: we headed home later than expected and I chastised the kids for trying to count the sheep as we biked by lest it put them to sleep. Goats! There are some very friendly goats near the end of the trail (marked on my map). One will amble towards you if you make eye contact. Bunnies! Our late return meant the bunnies were out in full force. We saw quite a few of them on the side of the trail near blackberry brambles. But it was too dark for my picture to be interesting so here’s a loose bunny we saw on our way to the trail in the morning. Nutria. We didn’t see any nutria, either, but there’s a sign about them. 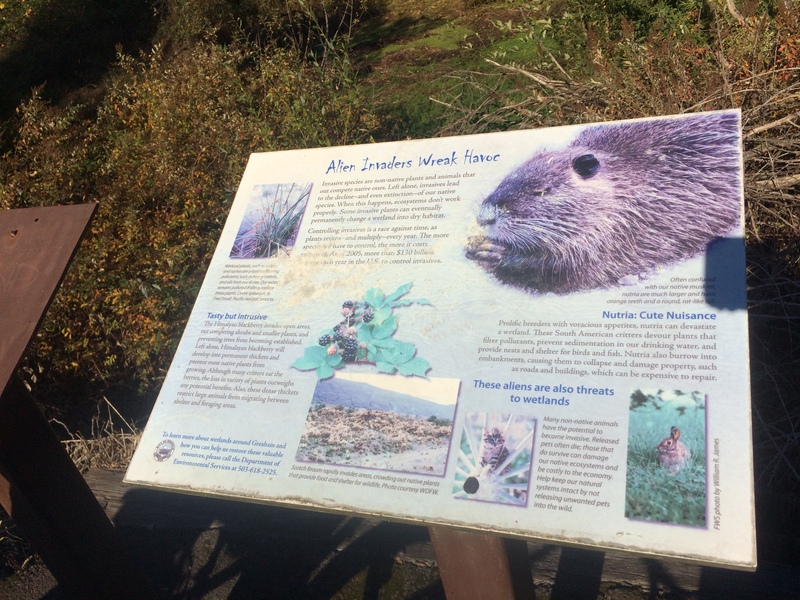 My kids would have loved to see one and spent a lot of time talking about nutria and beavers. Cows. Somewhere near the start we passed a field of cows. Not as exciting as the other critters, but they still count. I don’t know what to tell you for bike parking. I asked around during my test run and no one knew where I should park. I figured there’d be more staffers, including parking attendants, on the weekend and it wouldn’t be confusing. 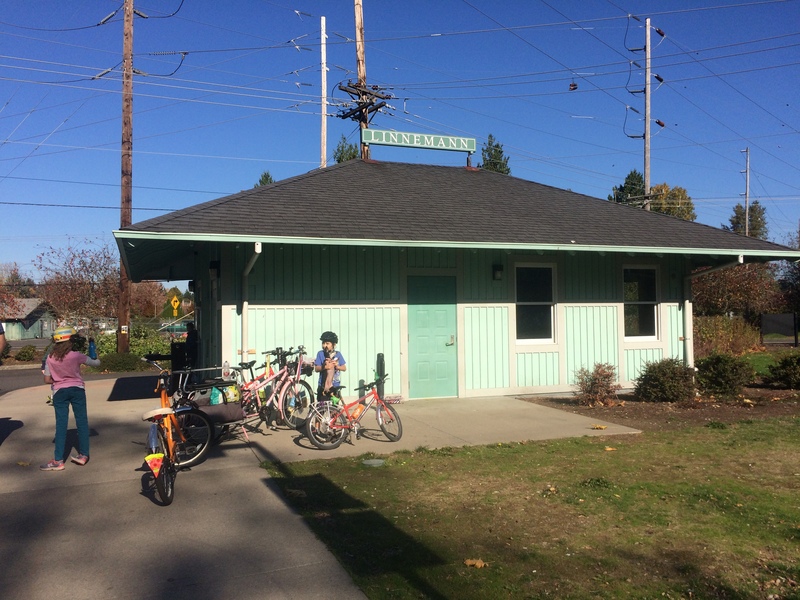 However, there’s no dedicated bike parking so I suggested I just put the bikes off to the side near the info booth and they were fine with that. 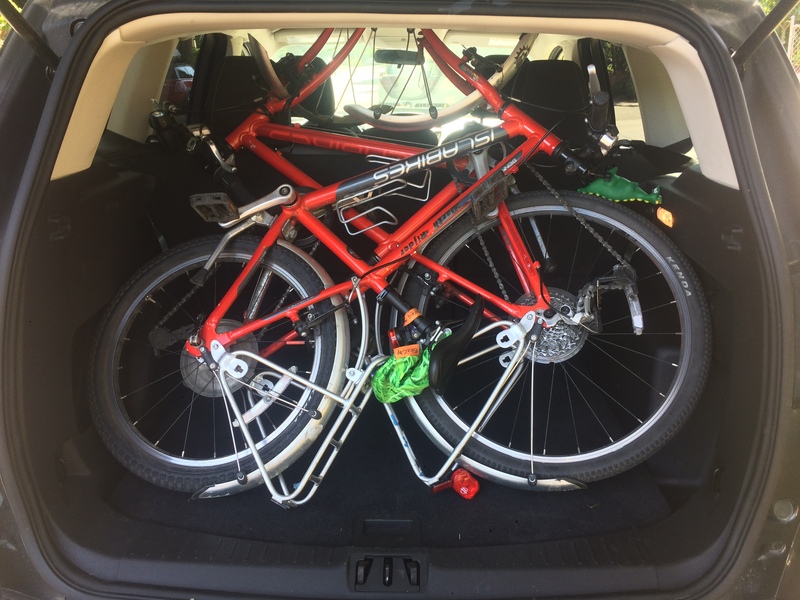 Kath and I both have sturdy double kickstands so we played bike racks for our families’ bikes. Tippy bikes could find a building to lean against. 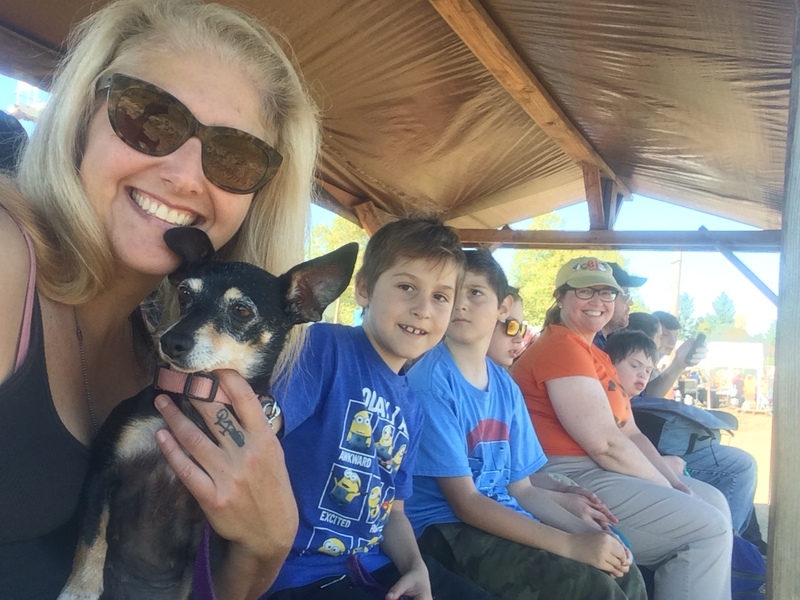 We bought complete passes and had a blast on the hay ride and in the corn maze. The price was reduced on account of some of the corn maze having been flattened by high winds, but it felt plenty big to me…in fact, the little kids made it through to the end while the rest of us gave up and backtracked out. We didn’t stand in the long line for the pumpkin/apple slingshot, but it looked awesome. The pumpkin selection was great and we left with three extremely big pumpkins ($20), one adorable tiny $1 watermelon-looking pumpkin, and a bag of apples for $5. We admired the “frickin’ huge” (apparently they say that a lot on MythBusters and I’ve failed to notice) $1-each Hanner apples. There’s barbecue on the weekends, including a good selection of kid options and a large, covered dining room next to the kid pavilion (which my 8- and 10-year olds found fun to play in, though it looks sized for toddlers). Perhaps the most exciting thing is that dogs are welcome! I didn’t realize that until seeing the sign during my test ride. 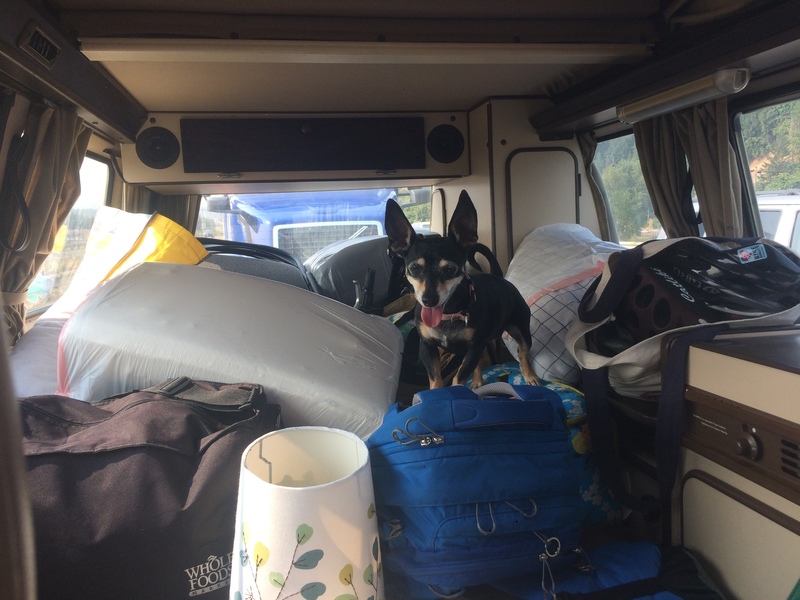 So Pixie came along and had as much fun as the rest of us. A lot of other visitors brought dogs, too. We were the only visitors by bike that day as far as I could tell, though. I heard one of the food servers mention a bike race at the farm on November 11th. Turns out it’s a cyclocross race, Corn Cross 2! I didn’t realize there was cyclocross within biking distance of us. 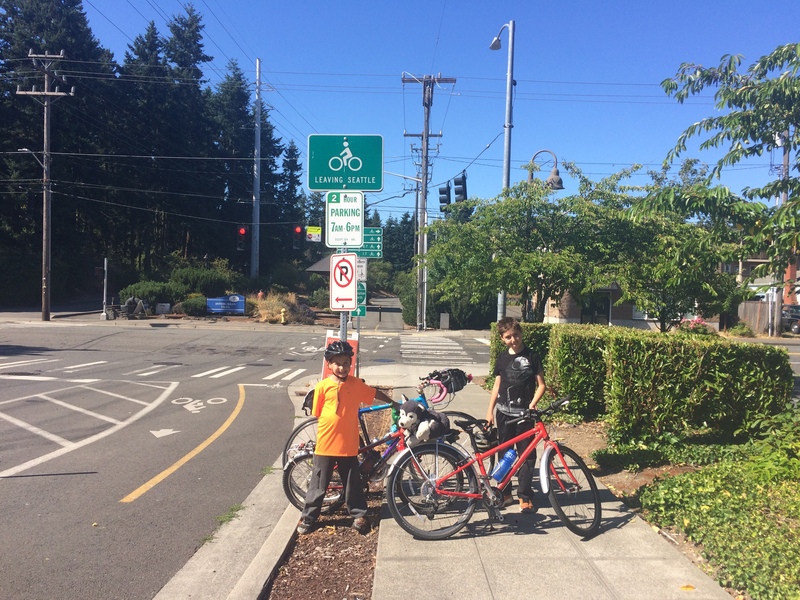 PIR and Alpenrose both seem way too far to bike to with the kids. My littles say they want to come back to Liepold for Corn Cross 2 to do the kiddie lap. Portland Nursery. 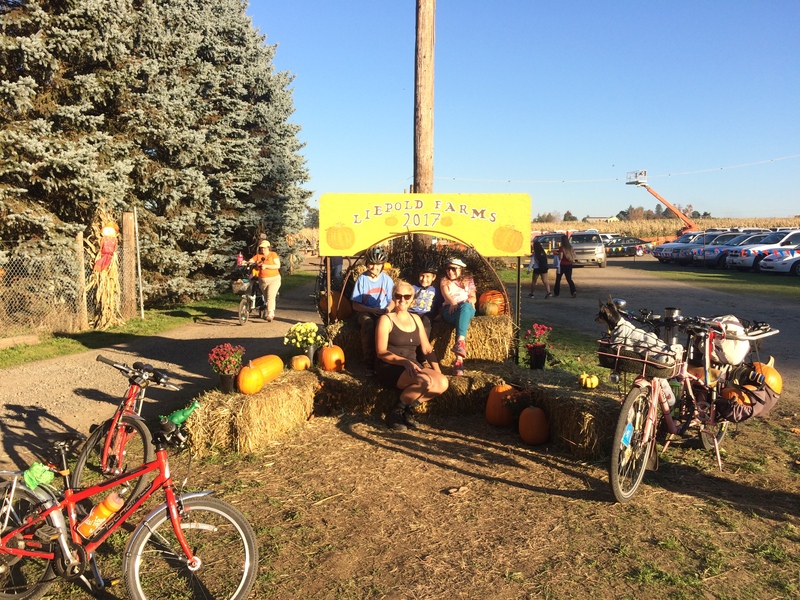 In Seattle we couldn’t bike to a farm, but we enjoyed visiting Swansons Nursery’s “Fall Adventures” by bike. 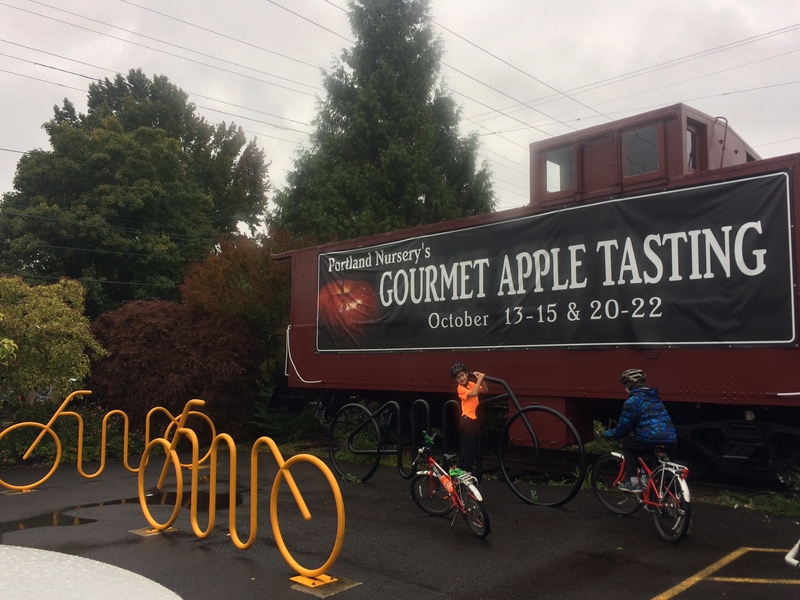 There are similar experiences in Portland, such as the Portland Nursery Apple Tasting and Kid Activities. 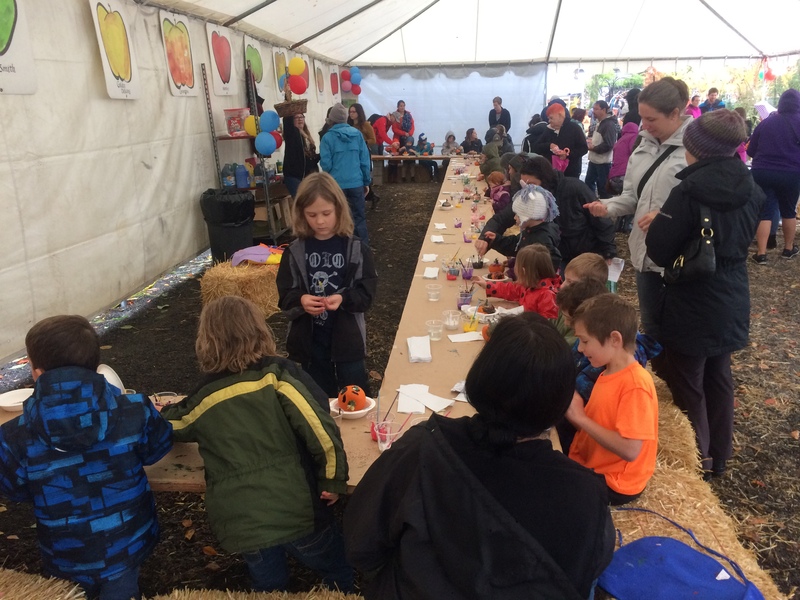 We visited on a very rainy weekend and had a great time choosing big pumpkins and painting little pumpkins. I was very impressed by the amount of bike parking. We’ll look for future activities here. Rossi Farms. 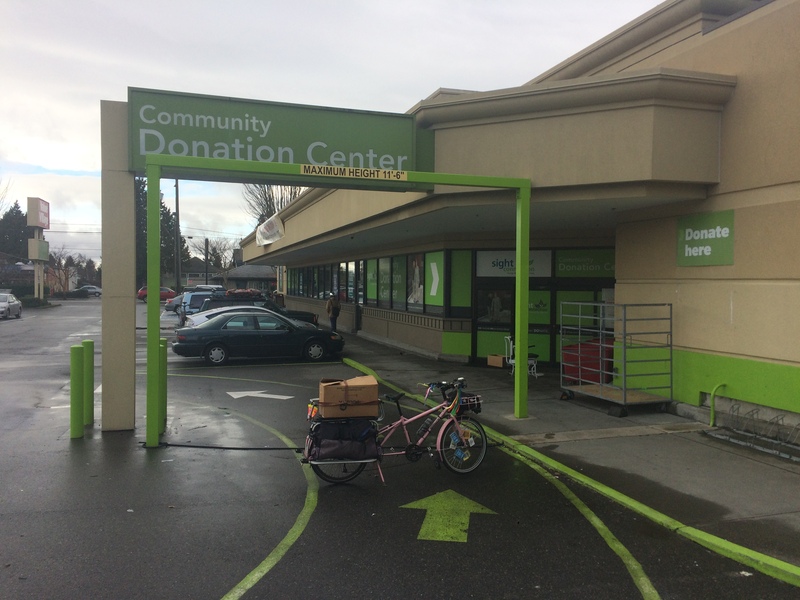 Rossi Farms is close to the I-205 Bike Trail so I did a test run there while on the way to IKEA (I can bike to IKEA!!!! Blog post coming soon), but I didn’t like the default route given by Google Maps once I left the trail so I’d have to do some experimenting (at least using Google Street View and possibly riding over alone again) before bringing the kids here. This is closer than Boring, but it’s more of a pretty wedding venue than an actual working farm. However, it has lots of pumpkins and free tractor rides so it’d be fun to visit next year. Bushue’s Family Farm. This farm is also in Boring and was my first choice for our big trip, but once I saw how far off the trail it is, I didn’t even visit for my test run. It looks like an awesome farm and has tons of farm animals (though no pet dogs allowed), but four miles of country roads felt like way too many. 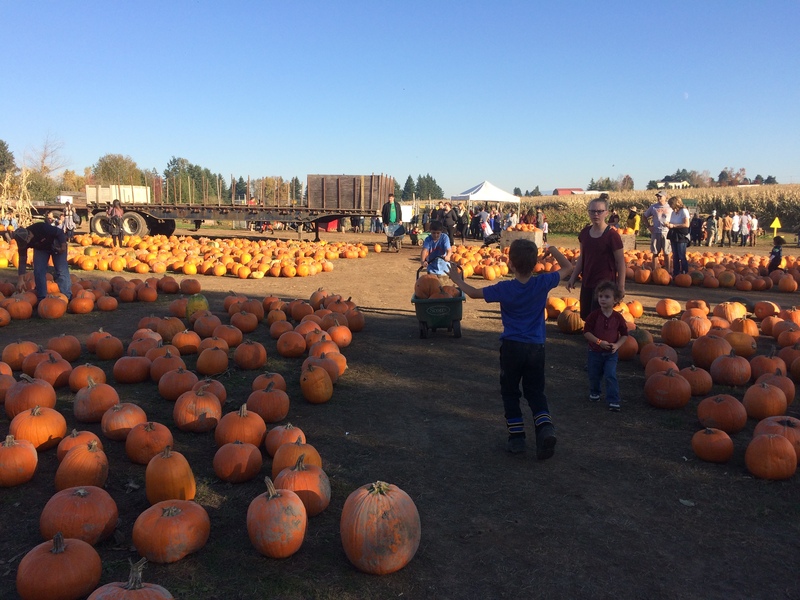 Sauvie Island Pumpkin Patch. 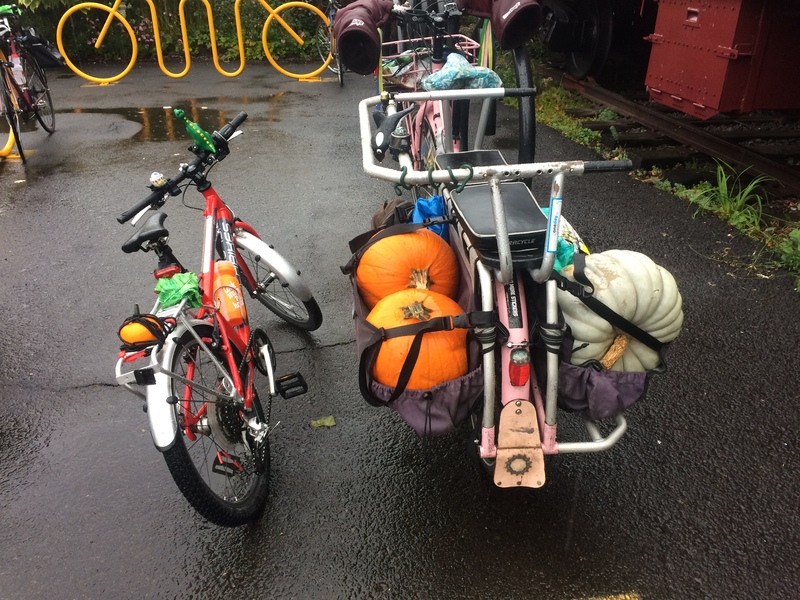 Sauvie Island seems to be the most popular pumpkin patch in the area and some people bike to it, but most people drive there. I hear highway 30 is horrible for biking so I don’t plan to ever visit, plus it’s farther from home. But I’d be remiss if I didn’t mention it when talking about area pumpkin patches. Have I missed any? Let me know in the comments! 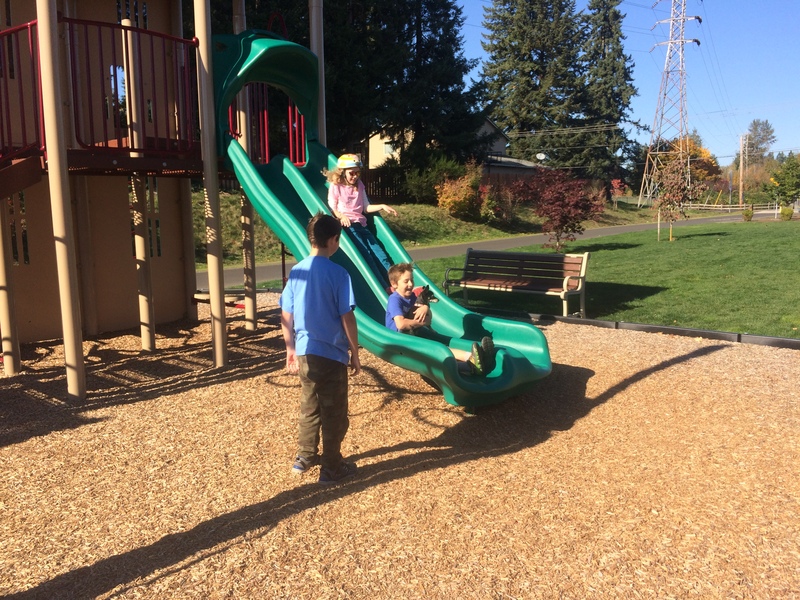 Our move from Seattle to Portland happened two weeks before school started so we had a good amount of time to explore our neighborhood and beyond before settling into our new daily schoolyear routine. Our school has so many bike staples! It’s not entirely fair to say Seattle is hilly and Portland is flat since Seattle has some flat neighborhoods and Portland some hilly ones. But I think it’s safe to say that in general Portland is flatter than Seattle. I’m happy to say we landed in a neighborhood that is flat as far as the eye can see. Versus our old neighborhood in Seattle which a biking friend referred to as “living on the side of a cliff” (which is an exaggeration, but other than two flat blocks to the east it was a steep two- or three-block climb or descent in all directions). 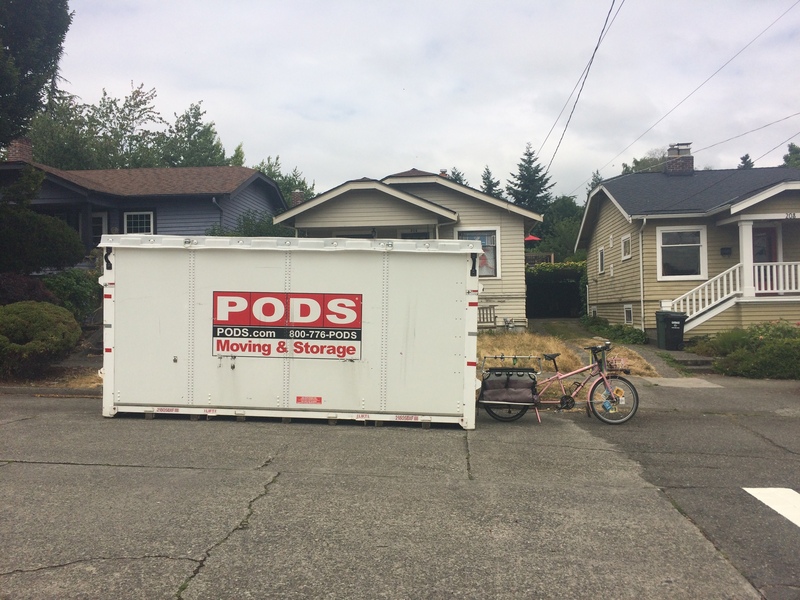 Our biggest change is that school is no longer a two-and-a-half-block walk from home (it took longer to put on helmets and bike than to walk so we only bothered with bikes on Bike to School Day). 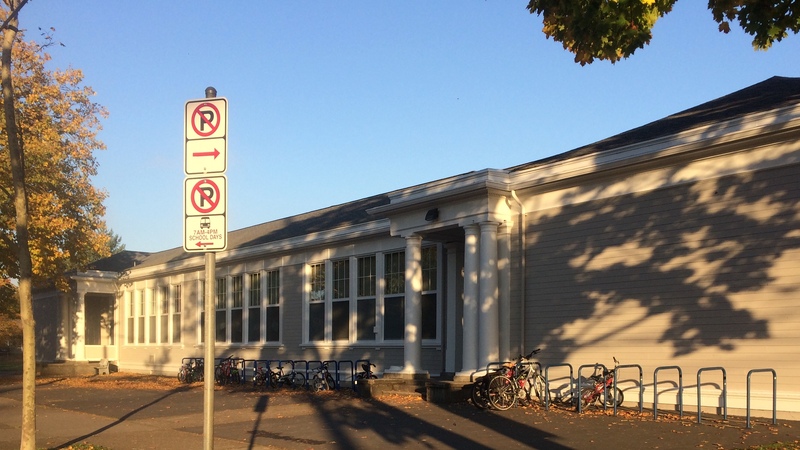 Now school is 15 blocks away–a legitimate bike-distance from home, and I’m pretty excited about that. One huge bummer is that my 10-year old broke his arm four days before school started. However, that meant I didn’t need to figure out a kid-safe bike route to school for a month. 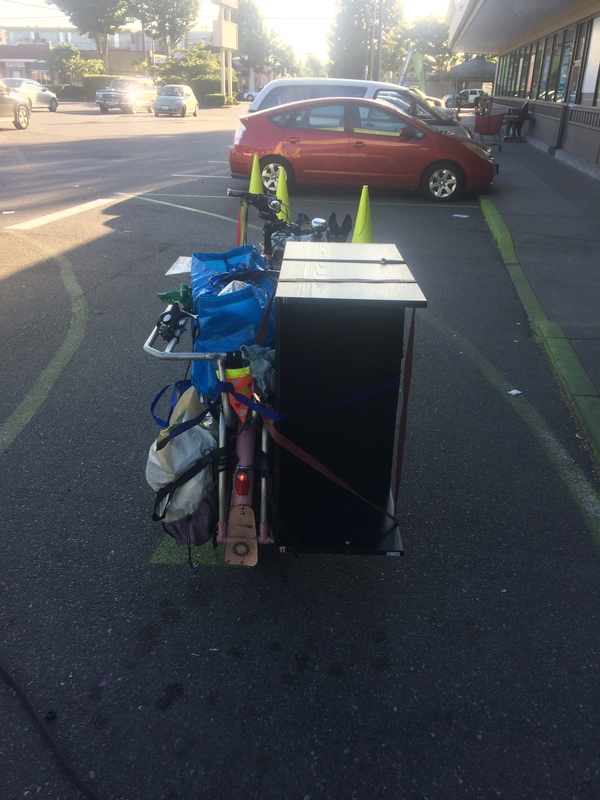 Allow me to stray from routing talk for a moment and acknowledge that my beloved cargo bike is yet again a lifesaver. The kids have been riding their own bikes primarily for a while, plus I needed them to ride on their own all the time while I was biking with a broken foot so it’s been a while since I’ve carried them both. And yeah, just the one kid broke an arm, but apparently there’s a rule that if one’s big brother gets a lift the littler kid gets a lift, too. I’m pretty sure the arrangement of kids we found ourselves in is the only way this would have worked. 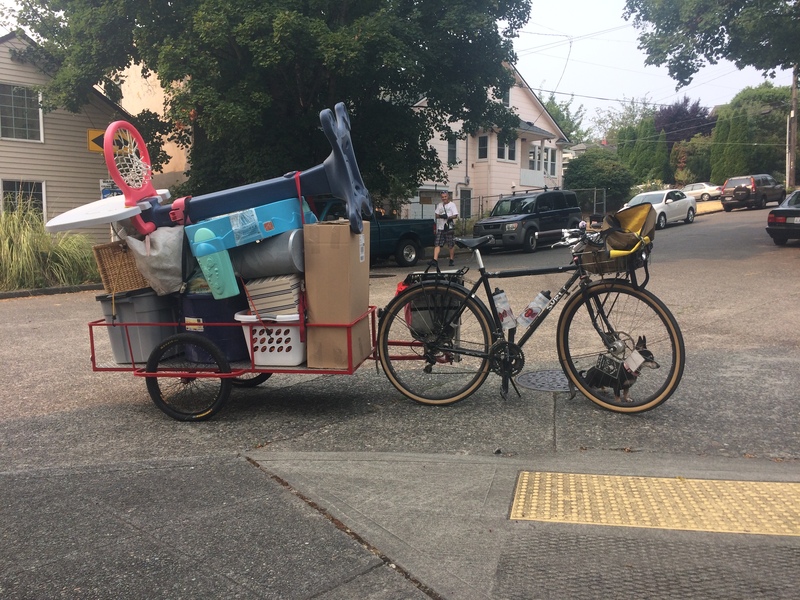 I keep only the left rail of my Xtracycle Hooptie on the top of the bike (the right rail is down low for stepping up to the deck) so my 10-year old with the broken left arm sat backwards at the front of the deck to hold the rail with his good arm. Then the eight-year old sat sideways or backwards to have adequate legroom. This put the heaviest part of the heavier kid at the closest spot forward and the lighter kid more forward than had be been sitting forward-facing. I think I would need an e-assist with throttle/boost button to get started safely if they were both facing forward with the little one in his usual front spot and the heavier one at the very back. Biking around our flat neighborhood was fine, as was the one decent block-long hill coming back from all points close in. 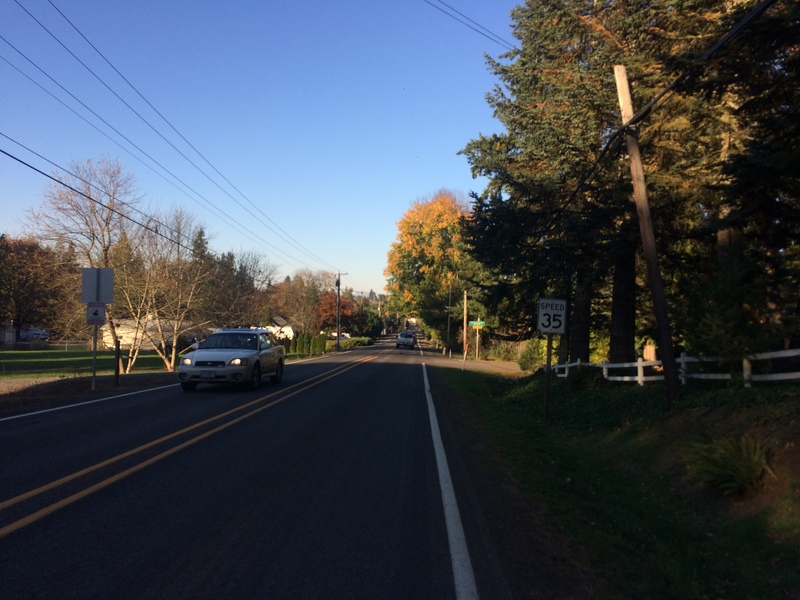 However, I had to stop twice to rest briefly on the big half-mile-long hill between the hospital and home. 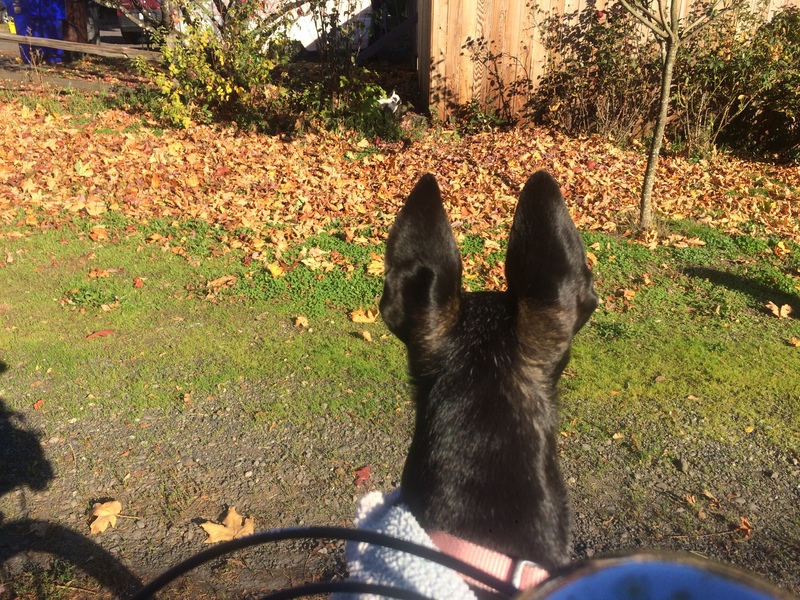 We took the bus to get to a few appointments downtown, though that was more out of worry about the kids sitting in the cold for such a long time on my bike–there’s always a bit of adjustment as the seasons change. Next broken arm (ha!) we’ll be acclimated enough to bike to the orthopedist. Portland has some awesome bikeways, but there are also quite a few busy streets that only have stop signs or stop lights if you’re crossing using another busy street. There are two busy streets (one east-west and one north-south) between home and school. Those intersections are OK for me alone or me carrying the kids, but I don’t like the kids riding through on their own bikes. I didn’t do a ton of exploring and experimenting, but the day before the cast came off I carried the kids on my proposed kid-friendly route to school and the kids declared it a winner. It’s 50% longer and takes over twice as long (I phrase it that way to sound dramatic–it only takes 13 minutes versus 6 minutes when I carry them on the more direct route). 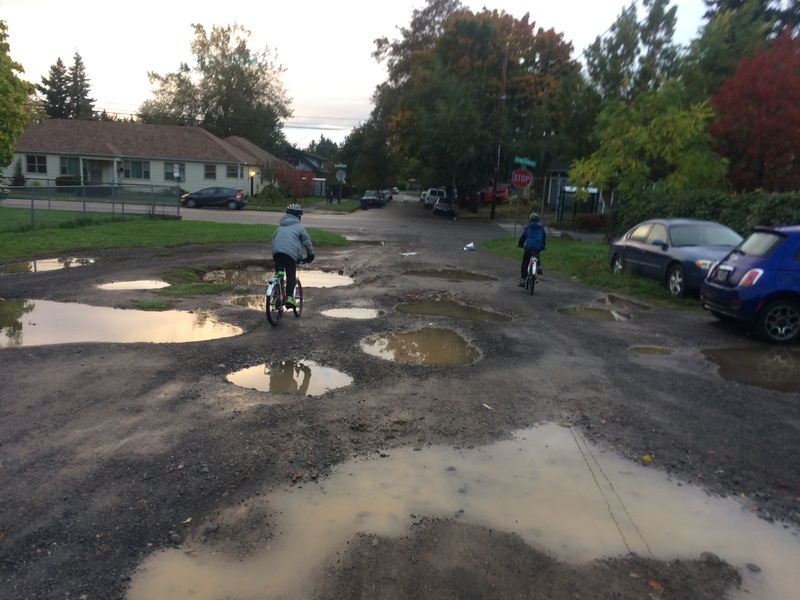 It also has more blocks of gravel than I imagined possible even in this neighborhood of many unimproved roadways. Obviously, that’s a bonus in the eyes of the kids. What I don’t consider perfect is that instead of biking in a door zone bike lane for one block (a BIG block, the length of three of our other blocks) we cut through a church parking lot (which is fun and safe, but not as ideal as using a quiet public street) to avoid half of that block and then we stick to the sidewalk for the other half of the block. But we all love the route! Highlights include spotting a feral cat, Mr. Moo, each morning and afternoon, the kids learning the different contours of our six consecutive unpaved blocks as the gravelly craters fill with rainwater and become enticing puddles, and my pride as the kids confidently zoom home ahead of me as soon as we cross the second busy street.